'Really, after the Acropolis what is there to see in Athens?' we've been asked back in the States. I chuckled over that question last weekend when I heard myself saying whining to The Scout, "My feet hurt and my head is full - I need a break - I can't absorb anything else for a few hours." We'd not gone anywhere near the Acropolis and yet. . . I was on Athens Overload. Now I'll admit the Acropolis, the towering icon of this city and considered the most important ancient site in the Western world, is pretty darn magnificent. Gazing at it from afar never grows old. We do it from rooftop bars, street-level restaurants and every chance we get when we're in Athens. Gazing at it is one thing. Visiting the Acropolis, which dates back to Neolithic times (4000 to 3000 BC), can be almost too much to wrap your head around even for the most devoted history buffs. A climb up the pathway to view its centerpiece, the Parthenon, can leave you breathless - both literally and figuratively. The Acropolis Museum at its base is so layered with history that it really requires more than one visit to absorb it all. This trip we were in search of answers to the question asked by friends in the States - just what else does this city have to offer. With at least 10 neighborhoods calling out to be explored we picked one closest to our hotel and set off. This is some of what we saw during our long-weekend in the big city. It didn't take us long to conclude. . . There is so much more to Athens than the Acropolis! A plus side to being ex pats in Greece is that Athens is four hours from our home in the Peloponnese. It has become a favorite getaway. Each time we are there, we declare that we must return soon as there is simply so much to see and do! Kolonaki District: Museums and More Museums. . .
On this trip, we found ourselves drawn to the Kolonaki District which sits between Syntagma (Constitution) Square and Lykavittos Hill. 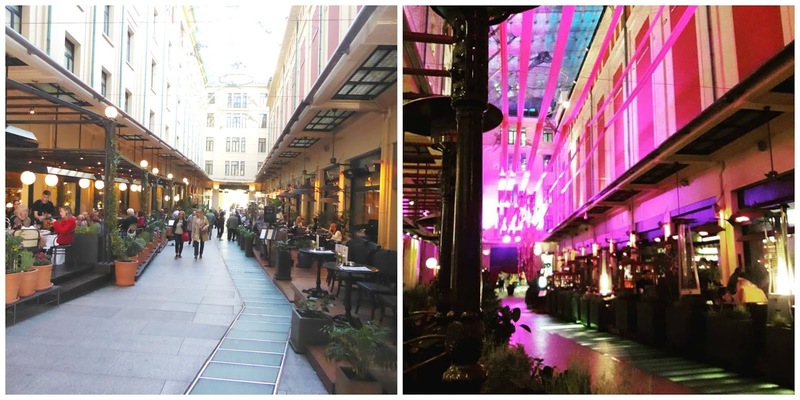 Because our hotel was located at Syntagma Square, we had only to cross the street to enter this chic, upscale district that has global designer brand stores, cafes and bars that could rival London's High Street or Paris's Champs-Elysees. It is also laced with other treasurers as we soon found out. Feeling much like we were setting out on a 'treasure hunt', our first 'discovery' was within a few blocks of our hotel. We came upon what appeared to be a mansion sitting amid a picturesque garden. 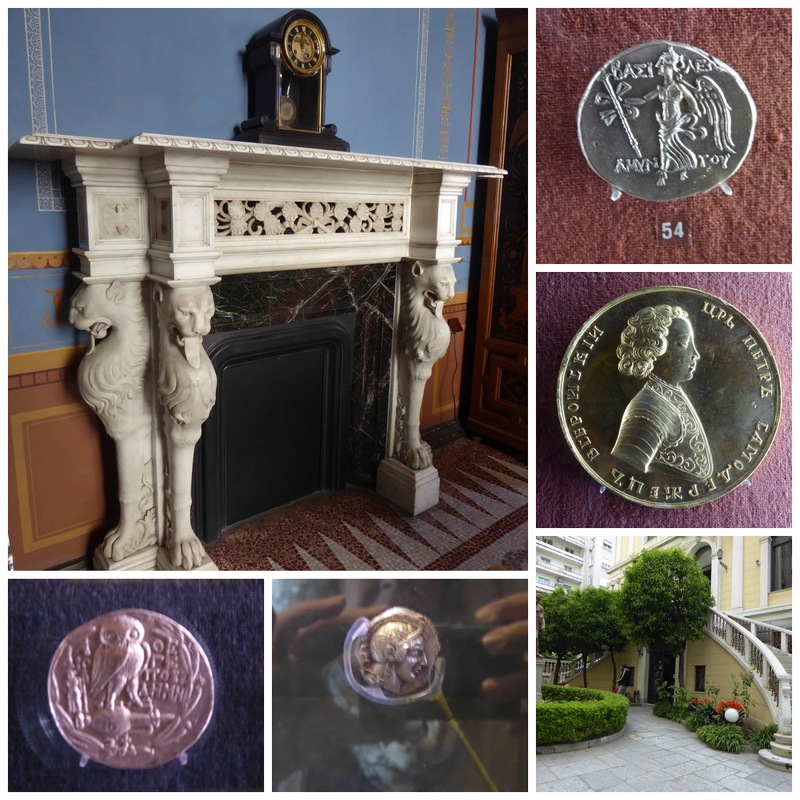 It was a mansion in a garden and is now home to the Numismatic Museum of Athens and showcases one of the largest collections of ancient coins in the world. The man's fascination with Troy was reflected in the 1881 mansion's décor as well as its name, Iliou Melathron, (Palace of Ilion), Ilion was the ancient city believed to be the site of the Trojan War. You need one trip through the place to look at the architecture and décor. Then another to concentrate on the coin collections, which turned out to be amazingly intricate pieces of metal artwork, so old it boggled the mind. Some were in circulation back in Troy, others during the time of Alexander the Great and Ptolemy, and others from the Peloponnesian War . . .and that is just to name a few. The ambiance and the displays kept us there longer than we could have imagined. There's a café in the garden with tables scattered about what was once the Mansion's back yard. You need not go to the Museum to enjoy a cup of coffee sitting in 'the garden of the Muses'. It was about the second hour of our visit and while on the third or fourth floor of the Benaki Museum (www.benaki.gr) the following day that my head filled to capacity and my feet cried out for rest. The Benaki Museum, reputed to be Greece's finest private museum and housed in a stately old building three blocks from Snytagma Square, offered us a chance to see hundreds of excavated relics, take a walk through the country's war history, and see up close textiles and lifestyles of centuries past. We skipped the visiting exhibition not for lack of interest, but lack of energy.We had underestimated the size of the collections and the vast amount of information they carried. Tickets at the time of our visit were: 9 euro; 7 for us who are 65 and older. The visiting exhibition had an additional charge. There is an upstairs café with balcony where one can rest and renew. Just a couple blocks further we came upon The Museum of Cycladic Art, (www.cycladic.gr) another private museum housed in such a beautiful building that we were tempted. . .but wisely decided a museum a day was all we could appreciate. There are nearly 100 museums in Athens ranging from its famous National Archeological Museum to others that showcase, for example, religion, criminology, folk art, marine, and telecommunications. You wouldn't be disappointed in either of the two we visited and we do recommend them. If they don't appeal, try a couple of the others, but do take advantage of at least a few of those the city has to offer. Now you all probably recognize Dionysos as the God of Wine. But did you know about Dionysius, a judge on the Areopagus (Supreme Court) in Athens in the First Century. He was converted to Christianity by the Apostle St. Paul. He ultimately became a priest, a bishop and philosopher of Christianity. It was the church dedicated to him that we found ourselves as we wandered the streets of Kolonaki. We'd set out to walk the neighborhood with no destination in mind, no timetable, no guidebooks. We did carry a map as it is easy to get turned around in Athens. We simply happened upon the Cathedral Basilica of Saint Dionysius, which turned out to be a gem of a find. Greek churches and the members of the congregations we've encountered are welcoming to visitors who are dressed appropriately and who take photos discreetly (and who don't take photos when services are underway!). We pretty much had the church to ourselves so we explored the icons, the art and soaked up the ambiance. And learned a bit of church history as well! We'd worked up a thirst as we explored the dozens of blocks that make up the Kolonaki district. Cafes and coffee shops line the streets. So many, that we often wonder aloud how they all can stay in business. And so many that it is difficult to choose just one to experience. We've picked several 'favorites' in central Athens and I wouldn't begin to try and recommend just one. I can tell you that one of our favorite places for sipping coffee or wine is the covered arcade -- home to a half dozen cafes --at City Link just a block from Syntagma Square. City Link -- a retail and entertainment center -- was the end result of a massive renovation project that turned the old Military Pension Fund Building into one of the more popular areas of downtown Athens. The arcade sits next to the, The Pallas Theatre, built in the early 1930's and now a part of City Link. Doesn't matter what time of day we visit, the vibe is one of life and vitality. People watching doesn't get any better. I don't want to have you suffering from the same Athens Overload that I did so I am going to save the tale and photos of our market and shopping expedition for next week and make this a two-part report. We thank you for the time you've spent with us and always appreciate your comments. We are curious . . .have you spent time in Athens and if so, what districts are your favorites and why? A big welcome to our new followers and also for those who've signed up to receive the posts as emails. It is but natural for Athens to have so many museums for niches of the ancient times. But I would like to know if there are other things to see besides collections of ancient things. Looking forward to markets and shopping! There are certainly more things to see and do than visit collections of ancient things, but that is usually what brings people here the first time and the history is what makes the place so rich. Stay tuned. Thanks so much for the Athens primer. I've been there, but long ago and I'm afraid my visit didn't dig much deeper than the Acropolis. Obviously, lots more to do. There's a good chance I'm headed there again this fall. Thanks for the tips. There is so much more to Athens than 'those tourist sites' and between this and next week's post I hope to inspire future travelers to set out and find them. I have a friend who's planning to go to Greece for a month. I know she'll be having a wonderful time. Tell her she must spend a few days in Athens!! There is definitely more to see than the Acropolis. You're right about that view though. It never gets old and we absolutely love it. The neighborhoods and number of side walk cafes especially in the districts are mind blowing. We enjoyed going from one to the other and sampling drinks and coffee. Looking forward to part 2 :-). And I so enjoyed your reports of your stay in Athens. I think there is something to be discovered in every such article as there is so much city to discover that I am overwhelmed with possibilities each time we visit. Thanks for stopping by! I've been to Athens a number of times and each time I enjoyed just wandering randomly as you did. The last time I was there, it struck me as a vibrant place, eager to pull itself out of the economic crisis. I am amazed at the number of people who still ask us when we are back in the States about 'the economic crisis' and if Greece is okay. It is simply vibrant and we can't seem to convince them. Pretty amazing to think that the crisis of 2008 is now more than a decade past and the people are moving forward with amazing energy and enthusiasm. A great reminder of my visit to Athens. I agree about there being so much more to see than the Acropolis - after all, Athens has centuries of history since the Acropolis was built! Good point, Karen. With all those layers coupled with all the new trendy stuff opening it is a perfect European destination. OOO, the romance this city has to offer...such gorgeous photos to add to your blog diary. I am forever in love with those sidewalk cafes..have seen so many in wonderful movies. The Acropolis certainly does get all the attention, but what a plethora of options you've given us. I think i'd really enjoy The Garden of the Muses, especially with a great cafe attached! I haven't been to Athens or Greece, but I am sure like any big city in Europe or anywhere for that matter, it has much more to explore than the icons. Happy travels!